Canadian Red Book is the vehicle valuation guide of choice for Canadian governments, insurance companies, financial institutions, auto dealers and appraisers. 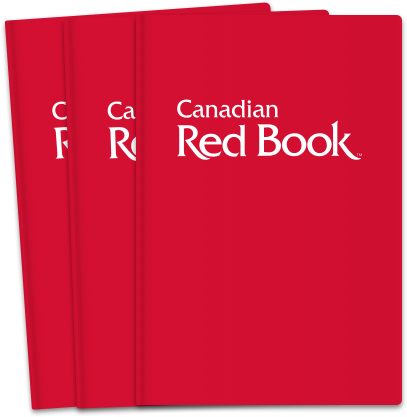 Powered by CARFAX Canada, Red Book provides the information our clients need in two simple, easy-to-use formats. Whether you prefer to access your valuation data online or in book format, Canadian Red Book has a solution for you. Updated four times per year and covering fifteen years of vehicles, Canadian Red Book gives you all the information you need to get the right value at the right time. Data provided includes Manufacturer’s Suggested Retail Price (MSRP), Average Wholesale Values, Vehicle Description and VIN information. Our books provide valuation information for the year/make/model you’re looking for, in printed, easy-to-reference format. There are two versions of Canadian Red Book: one for newer vehicles, and one for older models. Access to Canadian Red Book Online is a simple, intuitive experience allowing you to get valuation information on the full 15 years of cars and light trucks. Search by VIN, or to make things even easier, just enter the type of vehicle and we’ll provide suggestions. Need another format? Contact us at canadianredbook@carfax.ca and a representative will get back to you soon.